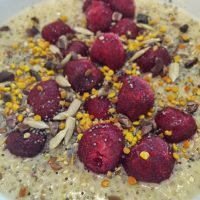 A beautifully warming recipe for breakfast to nourish and nurture your energy as we move into the cooler mornings of late Summer! Quinoa is an amazing grain to have for breakfast as an alternative to oats as it is loaded with protein which will keep you full and energised throughout the day. Feel free to play with your choice of unsweetened milks and toppings although watch out for dairy as it can dampen the Spleen, leading you to feel tired and quite often snotty! Rinse the quinoa and transfer to a pot, pour in 350ml milk, chia, vanilla, apple and honey. Bring the pot to a boil and then reduce to a simmer for 10-12 minutes until the quinoa has soaked up most of the milk. Take the lid off your pot and add in the rest of the milk, cinnamon and ginger. Cook for another 5 minutes. Taste and see if you need any more honey. Transfer to a bowl and top with your favourite toppings!